When I told the girls they were going to be staying on a farm in Cornwall they were over the moon. When I said they were going to see lambs being born they literally couldn’t contain themselves and I knew our stay at The Olde House Cornwall was going to be a real high to the end of our Cornwall road trip. I was so happy that they were looking forward to this Cornwall farm holiday as I have really fond memories of spending time on a farm as a child. My uncle owned a farm in Herefordshire and bred cows and sheep there. We would visit every year and I loved exploring the fields with my cousins and hanging out down by the brook. The hay barn was also an endless source of entertainment as I’m sure you can imagine. One year we visited during the lambing season, and I loved seeing all the lambs in the field in the spring time. Sadly one of the sheep passed away and left a lamb that needed feeding by hand. I literally couldn’t wait to step in and the lamb and I became very close while I was on holiday there. It’s surprising just how quickly they become tame and I really wanted a new pet. When it was time for us to leave I begged my Mum to let us bring the lamb home, but of course her fate was sealed and my job was done. Regardless of the lamb’s fate, these were such found memories from my childhood that I was really looking forward to seeing the girls enjoy a farm holiday, even if only for a couple of days. When we arrived we got to meet some of the family who run the farm. The Olde House is a part of a working farm called Penpont Farm and has been in the Hawkey family for over 100 years and three generations. We were told we could visit the lambing shed at any time which was brilliant news, but there was also an organised farm tour on Saturday morning which we wanted to attend as well. We were shown to our farm cottage and were given some information about accessing the pool and a few tips that were going to be helpful during our stay. The girls just wanted to get their wellies on and go and see the lambs, so we were probably in the farm holiday cottage for about 2 minutes before we were off exploring. We arrived at the lambing shed just as a lamb was being born and we got to chat to the farmer about breeding lambs. I had so many questions and he was more than happy to answer them. 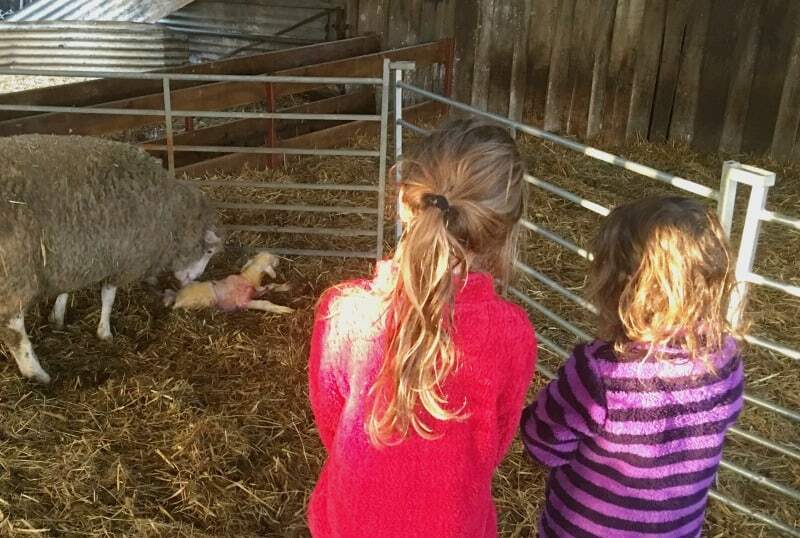 The girls were just blown away by watching the lamb being born. I was surprised by how much they were interested in what was happening but to them it was just completely natural. 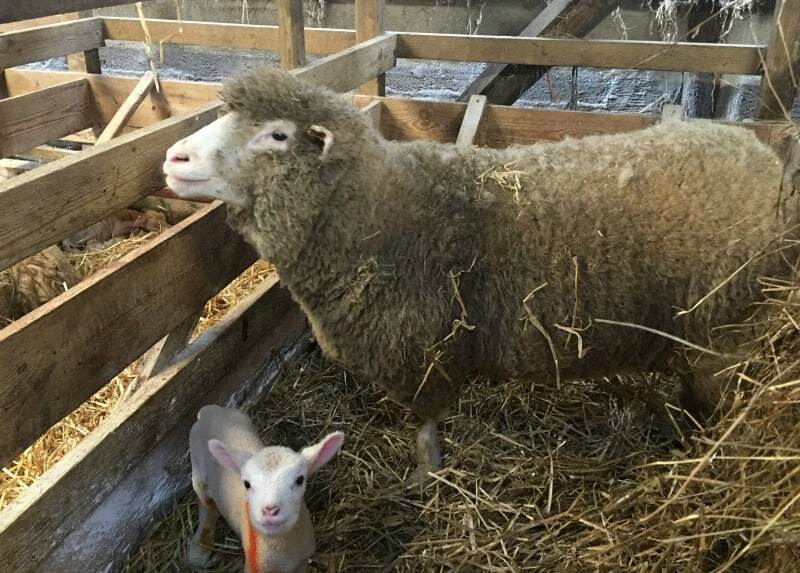 We stayed in the shed as we knew the sheep was going to have another lamb. There was no signs of her being delivered naturally so the farmer needed to intervene. It’s important that the lambs are born safely and it helps if the farmers are around to prevent complications from happening. Watching a lamb being delivered by a farmer probably isn’t quite so natural, but it’s part of the reality of farming and I thought it was important that the girls understood why this was happening. After all that excitement we went to burn of some energy in the play barn. 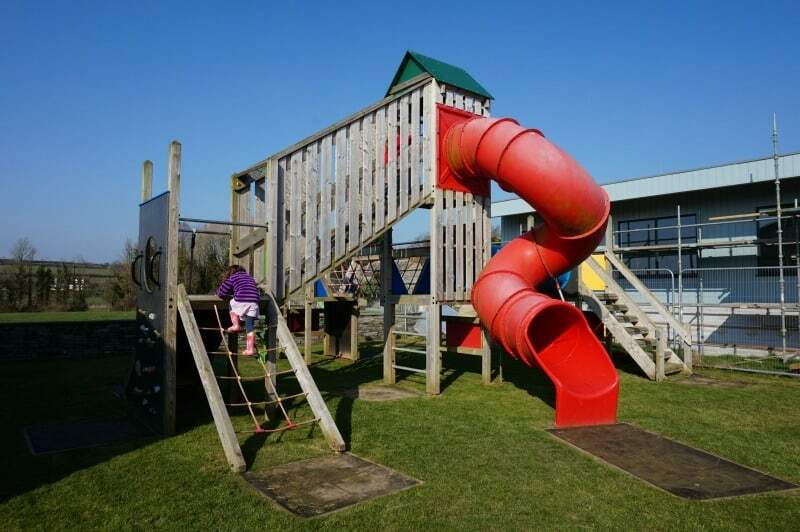 There are some excellent facilities at The Olde House and the soft play and outdoor play areas are just brilliant. The girls loved them both and I thought they were great facilities for families. Next door was also a pets corner and we popped our heads in there a few times too. 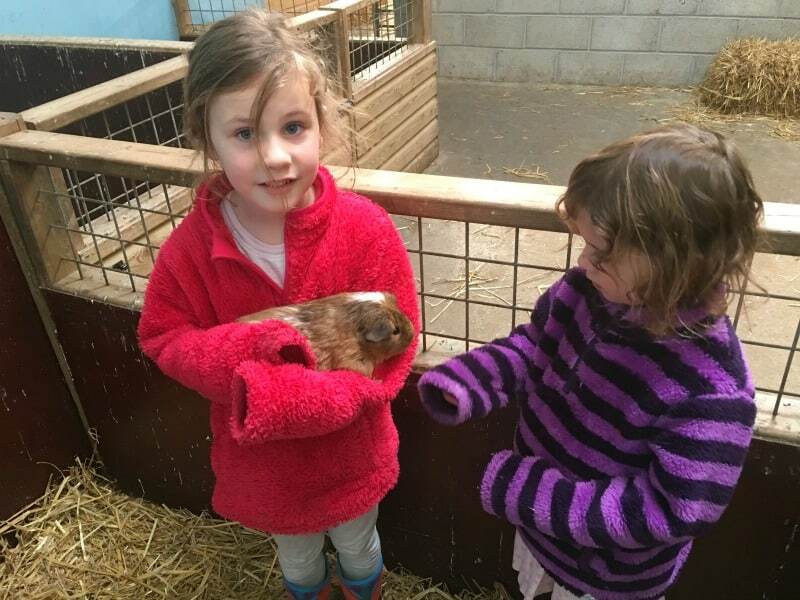 There were scheduled feeding times, but we weren’t organised enough to visit then but we still managed to get a cuddle with a guinea pig which made Indie’s day. We were staying in Hazel Cottage for the weekend, and when we did get to spend some time in it we found it was the perfect holiday cottage for us. The downstairs was open plan and had a real farm feel to it. 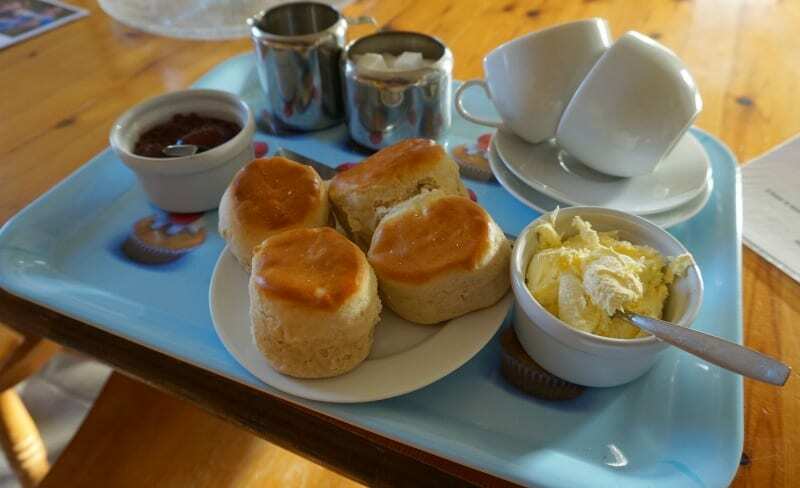 The fresh scones with clotted cream and jam didn’t go unnoticed either, and made for a perfect cream tea for us all. Upstairs we found 2 large bedrooms and a good-sized bathroom with a bath, which always goes down well with me having 2 small children. Each bedroom had a sink as well which made life a little bit easier in the mornings, and there was lots of space for clothes and personal items to be stored. There are 30 cottages at The Olde House sleeping between 2 and 10 people. 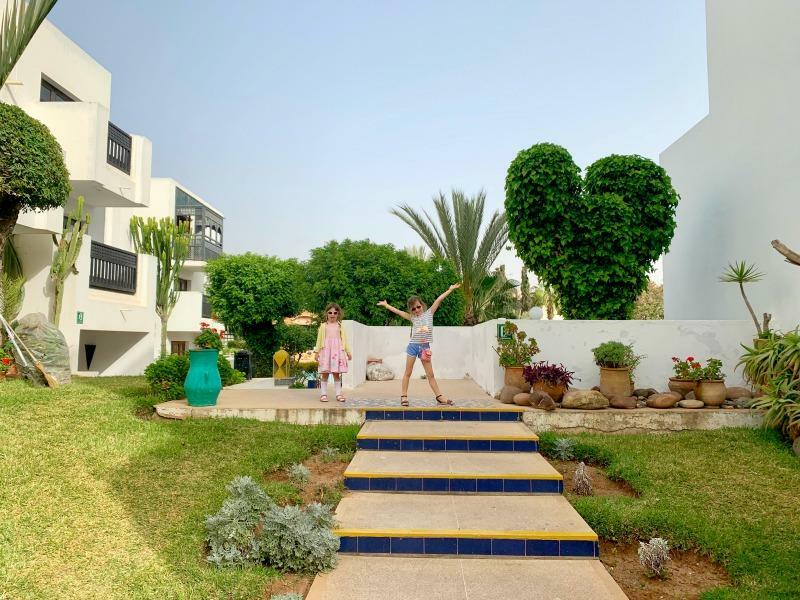 They are either purpose built holiday cottages or converted farm buildings and are a great place to stay no matter how big or small your family is. The Olde House seems like a great place to stay if you want to go on holiday with the grandparents or other extended family because of the size of accommodation the have available. For the lambing weekend, the Hawkey family arrange a special tour that all the guests are welcome to attend. We met in the courtyard at 10am and were given some history about the farm before being invited into the lambing shed. We learnt why sheep are scanned and how the farmers care for the sheep to make sure the lambs don’t get to big before they are born. We did get to see more lambs being born, but they did need some help from the farmers as well. The most exciting part was being able to feed and cuddle the lambs. Indie and Brook were beaming from ear to ear at being able to get so close to them and I really enjoyed seeing them so happy to be involved. It was a real trip down memory lane for me and such a lovely experience for them too. 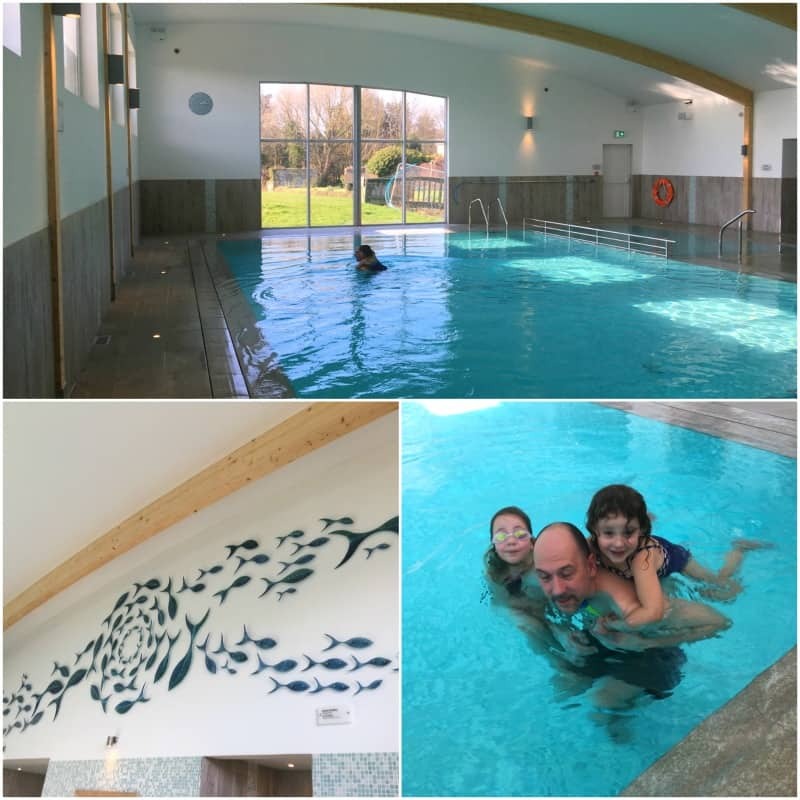 We made a point of spending some time in the new indoor pool and spa and we were so impressed with this facility. The new pool is lovely and the view across the open fields is really special. The girls really enjoyed splashing in the kids pool and playing in the larger pool. I managed to sneak off to test out the jacuzzi, sauna and steam room and they all get a thumbs up from me. 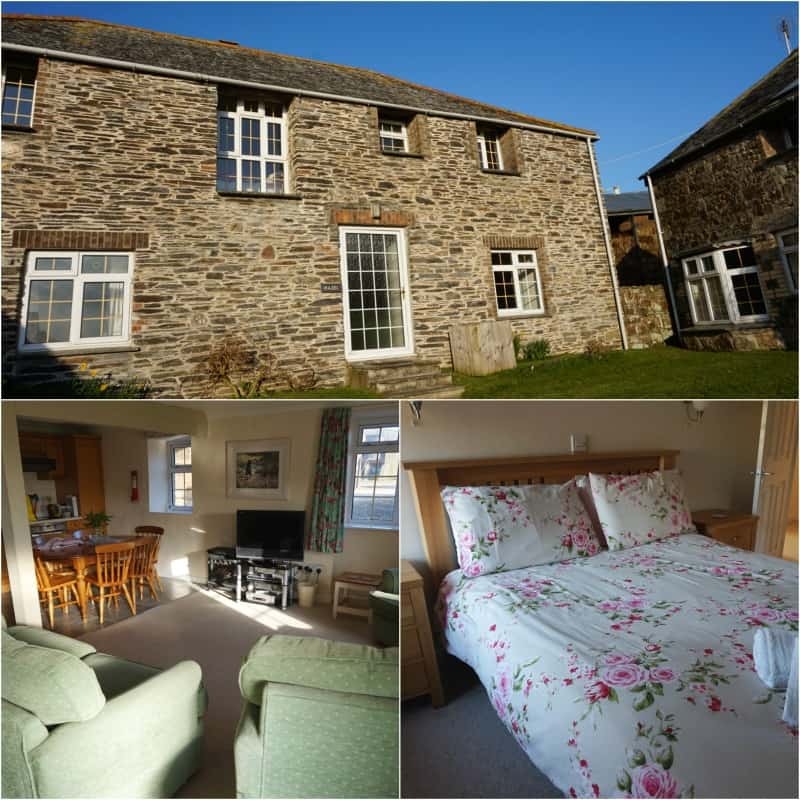 If you are looking for Cornwall farm holidays with pool, The Olde House will be perfect for you. You are probably wondering if we ventured off and explored the local area, and to be honest we didn’t. We were quite happy using the facilities provided by the farm and going to see what was happening in the lambing sheds in between. The organised tour is quite busy, so it was great to be able to go and see what was happening over the course of the weekend when it was quiet. Whenever we did go up there someone was always someone around to talk to us about the lambs and we also got more opportunities to feed and interact with them which the girls just adored. If we were staying at The Olde House, Wadebridge for longer we would have spent more time exploring the area as there is a lot to see and do near by. If you’d like to see what’s on offer The Olde Hosue have a really helpful tourist information page with details of local attractions. I think you’ve probably guessed by reading this post that we really enjoyed our stay at The Old House in Cornwall. I really treasure the memories I have of being on a farm as child so I had a fairly good idea that the girls would enjoy the experience. 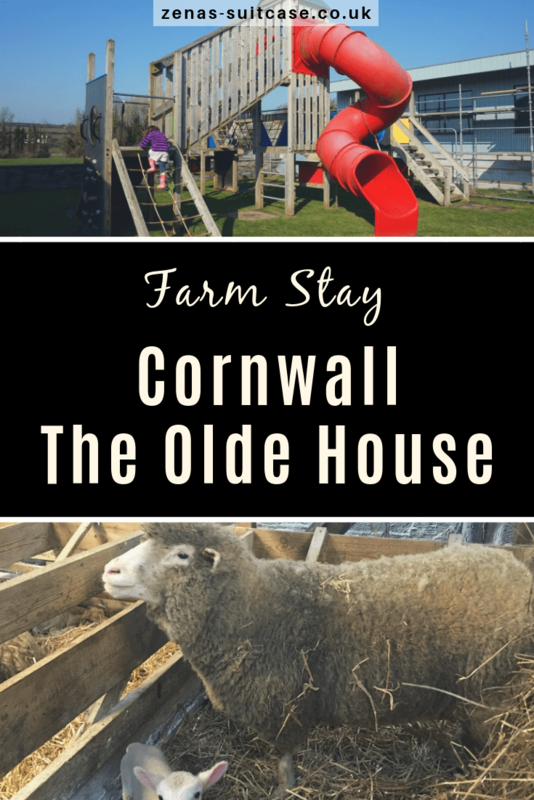 If a farm stay in Cornwall isn’t something you have experienced with your family yet, I really recommend that you try it out as it’s something that children of all ages will really enjoy. If your children play with farm sets and tractors just imagine how excited they will be if you take them to a real working farm? 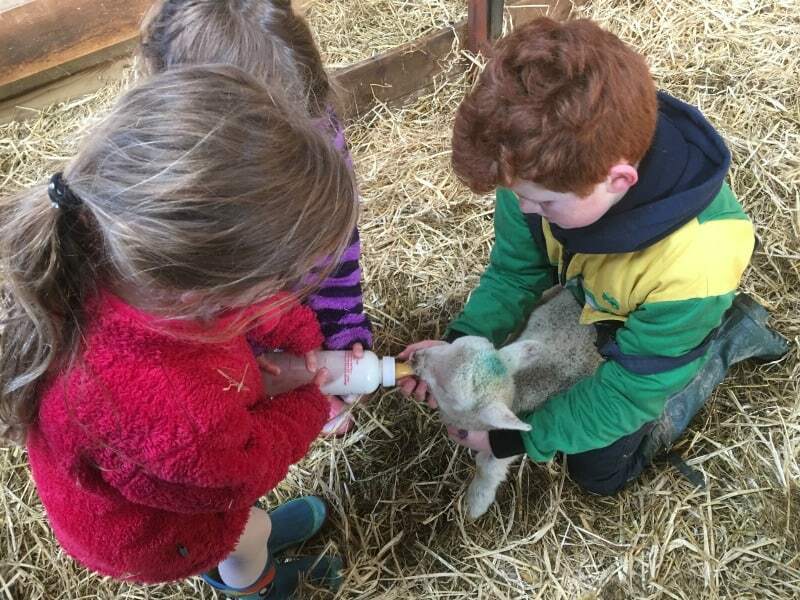 If you decide to try out a Cornwall farm holiday, I would strongly recommend that you take a look at booking a stay with The Olde House and I would also suggest that the lambing weekend is an excellent time to visit too. There is a cottage available at The Olde House that is graded as level 1 mobility for guests with specific needs. There is an electric charge point for cars provided and The Olde House also offers dog friendly stays. We were provided with a 2 night complimentary farm stay at The Olde House in Cornwall in exchange for this holiday review but all thoughts and opinions are our own. I love the idea of staying on a farm! What a fun active get away for the whole family. What a wonderful place to stay! It looks like you all (and especially the kids!) had a fabulous time. I’d love to go there with my family one day. This is such a helpful post for me as I am looking out for places to stay when we head to Cornwall in the summer, this looks like the place for us! Ooh what a lovely place to stay! We love staying on a farm, the kids really enjoy the whole working farm thing and being outdoors. I love that there are cottages for up to 10! What an amazing experience watching a sheep give birth but also feeding them. A great place to stay and the pool looks fab. Overall it looks like you all had a fantastic time ?? Like you, I have plenty of happy childhood memories of playing in a hay barn! My two city kids have had little exposure to the country way of life, so somethinglike this would be perfect for them. How cute are those lambs?? Staying at a farm, even if you just stay a weekend with your close and Friends then it’s an amazing experience that friends & family will never forget. When you visit in Maryland then don’t forget to stay at Tusculum Farm. Last year I had a trip with my family members and we have chosen to stay at this farm and its perfect destination for our trip and Tusculum Farm made our day. It was a great experience over there and I will highly be recommended who loved the spent time at Farm. Thanks for sharing such a wonderful post and I really liked it.